Paper and packaging multinational Mondi achieved an underlying profit of €295-million for the first quarter ended March 31 – a 15% improvement on the underlying profit of €256-million reported for the first quarter of 2017 and a 6% improvement on the €279-million reported for the fourth quarter of 2017. Higher average selling prices and profit improvement initiatives across the company more than offset higher operating costs, which increased as a result of maintenance shutdowns and negative currency effects. Like-for-like sales volumes were stable on the comparable prior year period, with growth in packaging paper offset by lower volumes in uncoated fine paper, owing to the extended maintenance shut at Richards Bay, in KwaZulu-Natal, in the first quarter. The estimated impact on operating profit of maintenance shutdowns completed during the period was around €35-million, compared with €10-million in the first quarter of 2017. Selling prices for the company’s key paper grades were, on average, above both the comparable prior year period and the previous quarter as the upward pricing momentum witnessed during 2017 continued. Mondi reported that costs were generally higher than the comparable prior year period and the previous quarter. Among key input costs, wood, energy and chemical costs were higher than the comparable prior year period. However, the notable exception was paper for recycling costs, where average benchmark European prices were down 15% compared with the first quarter of 2017, and 16% lower sequentially, as the Chinese import ban continued to impact on global trade. Cash fixed costs were higher, largely as a result of the impact of maintenance shutdowns. Mondi said currency movements had a net negative impact on operating profit versus the comparable prior year period, driven mainly by a weaker dollar and Russian rouble relative to the euro, and a net negative impact when compared with the fourth quarter of 2017 mainly as a result of a stronger rand. Mondi commented that the estimated impact of currency movements on operating profit for 2018 will be around €115-million, compared with €95-million in 2017, of which around €40-million will be incurred in the first half of the year. Mondi reported that containerboard markets remain robust, with good demand and limited industry capacity additions continuing to support pricing. Average selling prices were up significantly on the prior year period and more modestly up sequentially, on the back of implemented price increases through the course of 2017 and the first quarter of this year. Volumes were up on the comparable prior year period owing to the timing of maintenance shutdowns and the ramp-up of production from expansionary projects completed in 2017. The sack kraft paper market remains tight, supported by good demand and constrained supply growth. Sales volumes for sack kraft paper were up compared with the first quarter of 2017, while selling prices were higher both compared with the comparable prior year period and sequentially following price increases implemented in all markets from the beginning of the year. “In April, we signed an agreement to sell our flat sack kraft paper mill in Pine Bluff, Arkansas, in the US, with 130 000 t/y production capacity, to Twin Rivers Paper Company. The transaction remains subject to customary closing conditions and is expected to complete in the second quarter of this year,” Mondi said. Mondi reported fibre packaging made good progress in implementing price increases to compensate for the significantly higher packaging paper input costs. In industrial bags, contracts for this year were finalised during the first quarter, with a price increase implemented that largely reflects the full impact on the cost base of the paper price increase that took effect from the beginning of the year. Industrial bags also benefited from good volume growth, particularly in emerging Europe and the Middle East markets. In corrugated packaging, good progress has been made in recovering the paper price increase, with efforts in this regard ongoing, while volumes were flat on a strong comparable prior year period and pricing discipline, Mondi stated. “In April, we signed an agreement to acquire an industrial bags plant near Cairo, Egypt, for a total consideration of EGP510-million (€24-million) on a debt and cash free-basis. 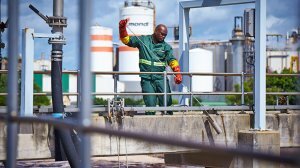 This industry benefited from the ongoing initiatives to improve the product mix and the programme launched in the second half of 2017 to restructure the cost base, although Mondi said near-term performance continues to be held back by declining volumes in personal care components and the generally challenging trading conditions. In continuing to drive performance, by aligning capacity to current market requirements, Mondi initiated a consultation process in April. This entailed a plan to cease production at its consumer goods packaging plant in Scunthorpe, in the UK, by the end of the year, while continuing to serve its customers from other plants. Uncoated fine paper continues to perform strongly, although the first quarter was impacted by ongoing cost pressures, the extended maintenance shut at the Richards Bay mill and a lower forestry fair value gain, which “more than offset the benefit of higher average selling prices” during the quarter. “As a result of continued cost pressures, price increases were implemented on Mondi’s range of uncoated fine papers from the end of March. While difficult to estimate, should the strength in the rand and current timber export pricing levels prevail, we would expect a lower forestry fair value gain in 2018 than recorded in the previous year,” said Mondi. Meanwhile, the company is making progress on its major capital investment projects at its Steti (in Czech Republic), Ruzomberok (in Slovakia) and Syktyvkar (in Russia) mills and the smaller expansionary projects at a number of its packaging operations. At Steti, technical challenges remain in the ramp-up of Mondi’s rebuilt paper and inline coating machine. “We continue to experience a strong pricing environment in a number of our key product segments, supported by good demand growth, although we do continue to see inflationary cost pressures across the company and currencies are currently a headwind. “With our robust business model, clear customer focus and culture of driving performance, we remain confident of sustaining our track record of delivering value accretive growth,” Mondi concluded.